The Rhizostomae (austrailan spotted jellyfish) is an order belonging to one of four classes of living Cnidarians (which are described by the possession of intrinsic cnidae). Rhizostomae are found in a variety of coastal and shelf marine environments and are acknowledged as important predators in marine planktonic communities. Rhizostomaes have a sexual gland. This is for making sperm or ovums, for making their babies. Rhizostomaes also have gastral cavity, it's located in the middle of the rhizostomaes body. It's kind of a digestive thing. Rhizostomaes have endoderm and ectoderm. Endoderm is located inside of the body and ectoderm is located outside of the endoderm, and those are for breathing (respiration). Rhizostomaes have legs, which are for swimming. Rhizostomaes have feelers, these are for feeling something from other bad things which are sensing things. Rhizostomaes also have mouth, for eating food. 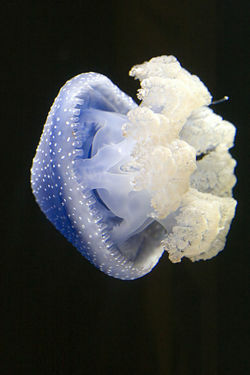 Rhizostomae is a part of the jellyfish family, it looks almost the same as the normal jellyfishes. Rhizostomae have a time of floating. Rhizostomae has antennas, so when they float to live, rhizostomaes don't think about their antennas and they just let there antennas be free. And rhizostomaes also make their bodies bigger, with gases. Those gases for lifting their bodies easily. When we are swimming if we drink an air and go under the water and we can't go and reach the bottom easily. And they have stingers, so they can protect themselves. So if others touch them and try to attack them, then they sting automatically. Rhizostomae are found abundantly during March to August with a peak in June and July. It happens in coastal waters and can be found stranded in rock pools or on the shore by receding tides. The Rhizostomaes have a great ecological impact and economic importance due to its happening in a variety of coastal waters and its acknowledgment as a predator in marine planktonic communities. At a fast rate after the 1970s, commercial fisheries for jellyfish developed. Since 2005, the fisheries have been at a small level. The fishing season extended from March to August with a peak in June, July. The catching is exported to Japan and other south-east Asia countries, after working. reproduction of rhizostomae Multiple authors. This page was last modified on 6 December 2008, at 19:49.